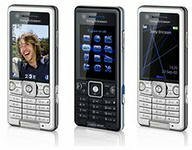 Sony Ericsson C510 is a mobile phone that is running Java Platform 8. His memory was a small 100 MB, works in the frequency ranges of GSM 900/1800/1900, UMTS 2100, there is the support of standards for data transfer GPRS/EDGE 10, HSDPA. Most of the interfaces Bluetooth v2.0 + A2DP, USB 2.0, camera 3.2 megapixel, there is no support for memory cards of format Memory Stick Micro (M2), up to 8 GB.